Registration: Option 1: £65 registration fee. This will include wheelchair hire from a registered wheelchair hire company and will come with instructions about how to unpack and use the chair as well as a fundraising pack. Option 2: No registration fee and you set your own target. This will include a fundraising pack, however you will need to source your own wheelchair. We’re asking people across the country to spend the day using a wheelchair to raise awareness and funds for Back Up. We know that using a wheelchair for a day will never give a full insight into life as a wheelchair user, but it opens up discussions about the challenges wheelchair users face and what people can do to make positive changes in terms of accessibility. It’s also a powerful way to get people involved and supportive of Back Up’s work. 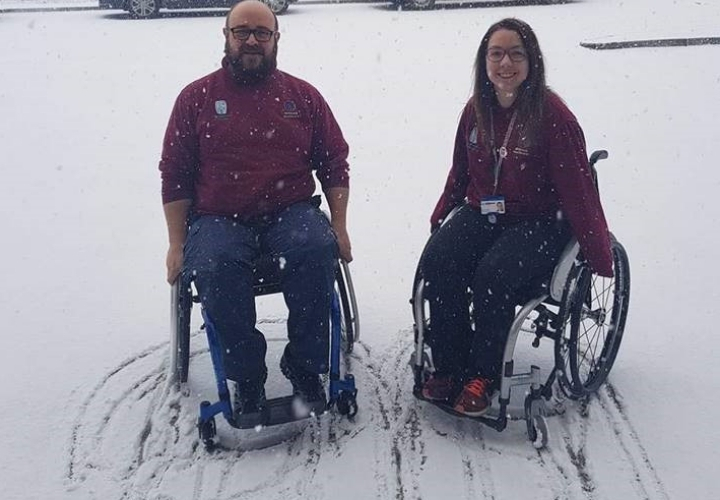 By taking part in this challenge, you could raise funds for our wheelchair skills sessions and others services that make an enormous difference to the lives of many people affected by spinal cord injury. Staff at Millbrook Healthcare raised £854 taking on the Wheelchair Challenge. Firstly, you’ll need to complete a registration form and pay the appropriate fee. Then, once you’ve sourced a wheelchair, the challenge is to spend a day using the chair while going about your daily routine. You can take on the Back Up Wheelchair Challenge whenever you choose and anywhere you like – at your office, school, at home – to make it fit in with your lifestyle. If you’d like to find out more or to register for the challenge, please sign up below or get in touch with a member of our fundraising team. We will support you throughout the challenge with tips, advice and fundraising materials to help you reach your sponsorship target. For individuals, community groups and schools, please get in touch with our community fundraiser, Reece, at reece@backuptrust.org.uk or call him on 020 8875 6749. For corporate teams, please get in touch with our corporate fundraiser, Tim, at tim@backuptrust.org.uk or call him on 020 8875 6772.